The South Pole: Solo but not Alone: Day 35: What a day...! That's all I can say here... Read all about it below...! Day 35: What a day...! That's all I can say here... Read all about it below...! 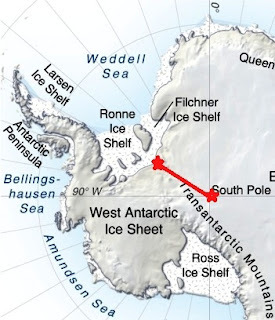 Just 9.2 latitude minutes, about 9 nautical miles, and exactly 15 kilometres away from the South Pole... Gee, this has been a long time coming, and did I have to work today! Note how many degrees of longitude I moved from yesterday - almost 6 degrees - but because I'm right near the Pole, that represents a small distance, versus 6 degrees of longitude wherever you are... In fact, at the latitude I'm at now, it's a 108km 'walk around the world', crossing all lines of latitude! Also, I am spinning at less than 3% of someone at the equator. I'll be stationary... Imagine that! Lastly: Today, and probably for the last week, I have been skiing precisely due South (true, not magnetic! 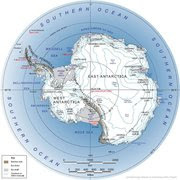 ), and tomorrow if I continue on that direction, as I will, I'll 'hit' the South Pole, and then instead of stopping, if I continue in exactly the same line of travel, I'll suddenly be going North! Where else in the world can I do that, hey! Haha, all stupid fun! Elevation: 2806 metres. Don't be fooled by the virtual 'no change' - I was at 2835 at one point. On wakening, I could hear there was a strongish headwind outside, but with only two days and 42 km to go, Mr Invincible can deal with anything to get to the Pole! Well, the morning visit to the outside toilet and the time-consuming tent disestablishment process were chilling experiences to say the least! Anyway off 'we' went, me dressed for maximum, cold, headwind protection. Hands were really aching as they tried to warm up inside my biggest mitts, but seemingly losing the battle. I had my full windsuit, face balaclava, goggles and full fur ruff creating a cosy little microworld if a stayed in a trance-like focus on the patch of ice 2 metres in front of me. Loose snow was being blown rapidly along the ice in waves coming from directly ahead, giving me a great course direction reference. I continued on, trying to get back into my micro, fur-rimmed world, but couldn't help myself stopping every now and again to appreciate the wonder of these humans being towed away at rapid speed further and further into the distance.The contrast of the white ice, cloudless blue sky, and red kites making for a great scene. The ice was soft: often as I tried to get on the glide, my pole would go through the surface down 30cm, having just the opposite effect. I seemed to always be skiing uphill towards 'a crest' that never seemed to crest. The wind continued relentlessly, the GPS confirmed I had no rhythm, and time seemed to really drag... All I could think about was getting to the Pole. Because of the bad headwind, I also decided to increase the time between breaks, and at the first break, I was really hungry so devoured the fruitcake, butter, and two chocolate truffles. I think the impact of all this cold, high fat food just hit my system, as I had the most difficult post-break recovery of the whole trip. My fingers pained, I had to stop and 'windmill' them many times to prevent them totally freezing, and for the first time my feet also started to feel the cold, and 'think about starting to freeze'... Hmm, why was this turning into such a difficult day...? I remembered my polar friend Dan's comment on the blog: Enjoy the last few days, the bad parts too... It made 100% sense, I had been there before, but I now needed to 'enjoy' these difficult times. Each time I started a positive, inspiring thought path, it went straight to a negative dead end! ...One of the crestless hills had a crest, and as I reached it, in front of me in the distance, right on course, lay what appeared to be some buildings / infrastructure... Was this the Pole? A few minutes of assessing things, and YES, it's the Pole!! Excitement levels rose, it looked like it was 3 or 4 km off, but the GPS doesn't lie, and Nunatak Day is still embarrassingly clear in my memory! No, I still had 21.6 km to go, and NO, I'm not there yet. But that's unfair, I can see it all clearly, I'm just as good as finished...! Hmmm, the torment! After 'complaining' so many times about the nothingness - the lack of 'beacons' - I now have 4 buildings clustered together, and another one who knows how far from the cluster, as never-getting-closer beacons to stare at for 5 hours tomorrow. Had I tried to do it today, I'd have destroyed myself! After seeing the buildings, my thoughts went to Amundsen and my North Pole expedition: With Amundsen, I thought about how he must have felt, searching within true nothingness for the something special point in it... there were no buildings, it wasn't a stop off destination like it is for me... He 'just' went to 'mark' the spot in the nothingness, confirm mission completed and then turn around and retrace his steps... Hmmm, this takes immense strength, character and deep motive. Re: the North Pole: there is no beacon, nor building, the day 'you' arrive at the North Pole, it could be a pool of -1.8C sea water! I thought this strange and difficult at the time, but with 15km of staring at a never-getting-closer building, I think in the huge difficulty of the Arctic, the North Pole obscurity is easier for the mind. Maybe Amundsen felt the same! Next one from the Pole... Hooray!! Hey Howard, I can't believe that you're nearly there !!! Less than a day to go !! Well done mate. Howard this is fantastic I am am so excited for you and find it very emotional just reading it !! You've left me feeling breathless reading this latest blog and I'm already aware of signs of withdrawal symptoms . . . I realise I am going to miss searching for each day's email from you/the relief when I see it nestled in my email box/then the anticipation of opening it to see what you have been through during each day. Now what have I to look forward to once you arrive?! I know - search for my own personal goal - but it has been such fun (tinged with anxiety) travelling with you! Howard! What a great blog entry ... can almost feel your excitement myself. Savour the last few km & the arrival at your pole. Looking forward to reading your final victorious entry so much. Howey, we are all holding our breath almost selfishly wishing that you would push through. Glad you cant read this now otherwise I know you would accept the challenge. Eagerly awaiting tomorrows blog. I'm really looking forward to your post once you have achieved your goal. Bet you go all mushy! Will you post while kiting back I wonder? Thanks for the interesting info on the direction.What an experience seeing humans,especially Christaan.Strange how the mind & body all have to be as one then the rhythm will follow.Nice story on the north pole.Well done !! !Wonder if you will sleep much tonight.This is mission almost complete. I presume you weremore irritated than you are letting on regarding the invasion of humans into your territory. Somehow aiming at buildings sounds a bit bizarre - wonder how it feels to be nearing "civilisation". Enjoy your last solo night and look forward to your last blog! Hi Howard, how inconsiderate of those guys with kites to intrude on our space. Couldn't they have found another route that kept them out of sight! I don't want to hear about these buildings just ahead! They have spoilt the wilderness, is nothing sacred, even the south pole!! I am already feeling the loss of sharing your wilderness time, such a rare phenomena in this crowded world of ours. My heart was pounding with excitement reading todays blog. Such an amazing achievement mate!!! Enjoy every bit of tomorrow and please have a walk around the earth... just because you can. Funny about marching south, and then the next step could be north! You must do it, don't you think? I can just see the red kites against all the blue and white..WOW. So, the South Pole had to give you one more day to let you know what it can be about, huh? I can hear your excitment, yet it sounds like a good decision to finish tomorrow. Well, Howard, give a shout when you get there..I'll be listening! Sandy T.
Congratulations! Counting out the food, broken poles and lost flask all seem so minor now. Enjoy the wine, whisky and Ruth's company in a few days. We look forward to seeing some pictures. Enjoy the rest(away from the marching routine) and your re-union with mankind. I hope the isolation that you went through makes you want to be friendly.